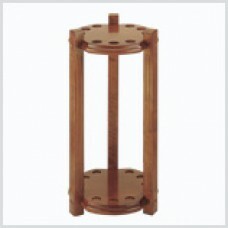 The 9-Cue Heavy Duty Round Floor Rack holds up to nine pool cues in a minimum of space. This rack is only 13" in diameter - the perfect size to fit in the corner of your game room or along a wall. This rack's heavy-duty construction makes it durable for years of enjoyment. Available in 3 stain finishes. H 28" W 13" D 13"
Unsure which stain color to choose? Use ourStain Matching Chart to determine which HJ Scott stain matches the finish of your billiard table. HJ Scott has what you want: high-quality, easy to assemble traditional racks & furniture with lustrous finishes that don't cost an arm and a leg. Most HJ Scott furniture pieces are available in your choice of three finishes: oak, cherry, or old world mahogany; with a select few pieces available in espresso, A.M.P. or black. We exclusively use true American stains that have been specially formulated to match those used by the most popular table manufacturers. As an added bonus, all ball grooves, cue holes, and drink holders are fully finished, polished and sealed; allowing us to eliminate felt that peels or cork that rots and mildews. HJ Scott racks are also easy to assemble, with decorative wood screws so you'll never have to deal with messy wood plugs again.